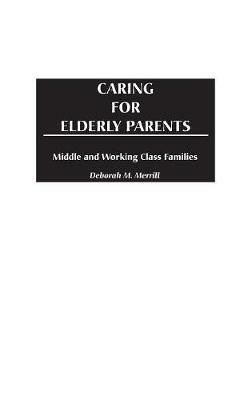 Based on open-ended interviews with adult children and children-in-law, this book documents how plain folk from the working and middle classes manage to provide care for their frail, elderly parents while simultaneously meeting the obligations of their jobs and their own immediate families. Adult children who care for elderly parents are pressured daily trying to juggle the responsibilities of work, family, and caregiving. Deborah Merrill shows how plain folk (as one caregiver termed herself) from the working and lower middle classes manage to provide care for their frail, elderly parents while simultaneously meeting the obligations of their jobs and their own immediate families. The evidence is drawn from open-ended, in-depth interviews with adult children and children-in-law, all of whom have worked outside of the home at some point during caregiving. Merrill examines the strategies that caregivers use to combine work and caregiving and the accommodations they make in their jobs. She also points to the pathways that lead family members to caregiving roles and how those pathways vary according to family history, gender, and in-law status. By focusing on class differences in caregiving and pointing to policy implications, Merrill has provided an invaluable resource for students, researchers, and policymakers in social work, gerontology, family studies, and social issues.